At Eisert Wealth Management we strive for excellence, in everything we do. Our primary focus is wealth management and wealth preservation. Our clients are business owners, wealthy retirees and investors still building wealth. In every client situation, our mission is to provide personalized investment advice that strives to minimize their concerns and maximizes their investment results. Eisert Wealth Management has served the Tri-State area since 1980. We are a branch office of Peak Brokerage Services, an industry leader. They possess a proactive culture that fosters collaboration, flexibility, and support. Peak is a correspondent firm of Raymond James Financial, Inc., a Fortune 500 company. Together, we strive to provide world class services and solutions for your financial needs. Our associations give us a tremendous strength of capital and guidance, but still we operate as an independent financial firm. We are free of corporate demands and proprietary products. We work for you. We feel this combination of strength and independence is the best model for helping you achieve your financial goals. Maybe their accounts just haven't done well with their past advisor. Maybe they just need a second opinion. Maybe they are interested in our investment strategy or unique services. Maybe they are new to the area and need a local advisor. Maybe they are do-it-yourselfers and realize they need help. Maybe they have experienced a recent family change. Every client's situation is unique and calls for a personalized strategy. Every client needs a financial advisor that is experienced, capable and working in the client's best interest. 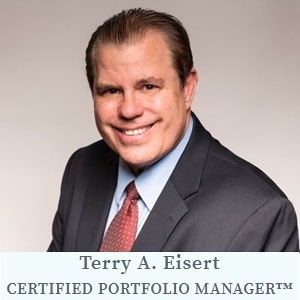 We believe that Eisert Wealth Management is uniquely situated to help you achieve your loftiest financial aspirations. When you enter the doors of Eisert Wealth Management you can be assured of receiving the same care as we give our own family, because here, you are family. Kindly give us a call; we will be honored to help you!